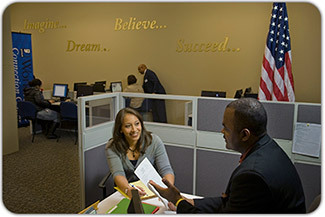 Goodwill Workforce Connection Centers provide local companies with the opportunity to meet with people in the community who are looking for jobs and want to be connected to area businesses. Partner companies can share information about themselves, meet with potential candidates and even interview onsite. For a listing of our Illinois Workforce Connection Centers click here. Our Goodwill Workforce Connection Centers are now on Facebook! If you're an employer or job seeker in the SE-Wisconsin or metropolitan Chicago area, we encourage you to follow the page to learn more about what our Centers can do for you!